The Siberian Husky is a Northern breed of dogs that typically have a wonderfully friendly disposition, neither people nor dog aggressive. Their height ranges between 21-23.5 inches for male and 20-22 inches for female at the withers, with a weight of 45-60 and 35-50 pounds respectively. 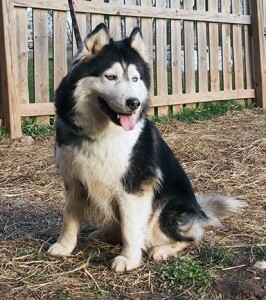 They have a very thick coat that needs little care and does not mat or require brushing except when they shed. Even then it does not mat, but it is impossible to exaggerate how much hair a Siberian has packed onto his moderate sized body. However, every Siberian owner knows why a Siberian is never cold when they see their dog shed for the first time. Siberians come in all colors, the most common being black, grey and red. The color of the coat may be distributed solidly over the back and neck with white legs, chest and muzzle or be distributed in patches–called piebald. If the color of the coat is “restricted” from the hair, the dog will appear white and have either black nose pigment or liver nose pigment depending on if the dog is a white appearing black or grey dog or a white appearing red dog. Eye color is also varied and ranges from whitish blue to dark brown. It is common to see dogs with different colored eyes or even having one or both eyes having swirls of both brown and blue in the same eye–the so called “parti-eye”. No coat color or eye color is preferred–the important thing for the Siberian Husky is having the structure to run, the temperament to be a companion and worker, and the genetic health to be a sturdy, strong member of the family. The Siberian Husky is generally a very healthy dog, not being plagued with many of the skin, hip or heart problems of many breeds. They do have a significant risk (the breed average is reportedly 15-18%, though it may well be higher because of the number of pet dogs not checked and sold from puppy mills and back yard breeders) of juvenile cataracts with onset usually between 9-15 months. Corneal dystrophy and PRA (progressive retinal atrophy) are much less common than cataracts but still inherited eye problems to be aware of. Hip dysplasia is reported by OFA to be at about 3% for the breed though again it is probably considerably higher because of the number of dogs whose hip x-rays are never sent in and because of the number of puppies produced by backyard breeders and puppy mills that don’t carefully screen prospective sires and dams. Puppies purchased by such unsuspecting persons are unlikely to be taken in and have their hips x-rayed and a large number of dogs with hip dysplasia do not have ambulatory problems until they are older and then they might well be considered just “arthritic”. Siberians are usually very sweet gentle members of the family and the typical properly tempered Siberian is predictably good with children. They are not protective by nature so they will not bite your children’s friends when they are rough housing or attack an unsuspecting neighbor who jumps your fence. They are nomadic and nonterritorial though, the flip side of their being nonprotective, and so must be restrained by being fenced or on a leash at all times. As they are extremely intelligent, they get bored easily and if left without a source of amusement, will create their own fun which is likely to be digging out of the fenced yard, re-excavating the yard and garden or removing the house siding. They do best as a member of a family that can accommodate at least 2 dogs. Siberians love companionship–they were bred to be members of a team–and can become destructive and depressed if not given the companionship their intelligence and nature require. Siberians love to run and can do so for hours, so a second dog will help them both keep exercised by letting them run in an enclosed yard or field. Siberians are not hyper indoor dogs, apart from normal puppyhood energy, though and so make good indoor dogs, as long as they are not left for long boring periods alone. Siberians can be vocal ~ they tend to “woo” rather than bark. Most Siberians possess a high prey drive, which is why they are usually NOT good companions for cats, smaller dogs and other small creatures. While Siberians are extremely intelligent, this does not mean they are obedient. Most Siberians have their own ideas of what they want to do, well before you give them a command to do something, and will be on their way to doing what they thought of first before hearing your command. Siberians, like most Northern breeds, are difficult to make come when they are called and are likely to turn to you, after you throw a ball for them to fetch, and say, “you threw it, you pick it up”. Experienced obedience people have made unbelievably well trained dogs out of Siberians because the breed is so smart, but the average dog lover makes too many mistakes in training this intelligent breed, such that the Siberian learns how to get his own way and teaches you to accept it. Siberians, like all purebred dogs, are best purchased from responsible, knowledgeable breeders that are producing puppies for the love of the breed and so they can keep something out of the litter for their own show or racing purposes. Beware of anyone breeding to sell puppies without evidence that the breeders are working or showing their dogs. While working or show breeders may have somewhat more expensive puppies, their investment in the breed, and hopefully knowledge, should motivate them to produce healthier, more predictably Siberian-like, puppies that they themselves will want to keep and that you will have the privilege to love. Happy trails!